A few posts back, I wrote about a book that David Nash had found on Amazon.com, which appeared to be a bi-directional crossword-puzzle book between English and Wageman [sic1]. It seemed as though these books, and a few others on Amazon on Wageman, contained the very same wordlist collected by a previous researcher and published under copyright at AIATSIS. This is by no means an isolated incident. Parker has wordlists for around 600 languages stored online, and could potentially create crossword books, dictionaries and thesauri for each of them. See also Peter Austin’s post at Transient Languages and Cultures regarding a similar thing having happened to the Kamilaroi/Gamilaraay dictionary. Instead of letting this issue slide into the obscurity of my Mabitjbaran, or Archives, I bought a copy of each, English to Wageman and Wageman to English, and have made contact with the ‘author’, Philip M. Parker, to solicit his explanation of what appears to be a blatant violation of copyright restrictions. First thing’s first though. The books actually appear to be a pretty good educational resource, assuming that the school in Pine Creek is up to the point of recommencing its Wagiman language programs, of which I’ve only ever seen fleeting bits of evidence of ever having taken place2. The books comprise probably hundreds of automatically generated crosswords with the solution words in alphabetical order at the bottom. In spite of the books’ copyright restrictions by their supposed author, I’ve scanned a page of one of these books, which you can view here. I’ve also done a little more background research on the author of these books, Philip M. Parker, and as it turns out, he’s not at all involved with dictionary compiling, language work or language education. In actual fact, he’s a professor of marketing and a generic entrepreneur at the Singapore campus of an international private business and marketing college based in France, called INSEAD. He even has a biography page on Wikipedia, which is interesting to this topic, as it goes into detail about his book publishing career. Apparently he’s quite famous in the marketing and entrepreneurial world. His fame derives from the fact that he has developed a process that automatically produces and prints books on demand, with little or no interactive work. Each book that gets printed costs him an estimated 12 pence Sterling. So good is his software apparently that he has authored 85,764 books on sale at Amazon.com. Parker estimates that it costs him about 12p to write a book, with, perhaps, not much difference in quality from what a competent wordsmith or an MBA might produce. Nothing but the title need actually exist until somebody orders a copy. At that point, a computer assembles the book’s content and prints up a single copy. Riveting. And that costs US$495.00, in case you were wondering. What Parker does is harvest data, irrespective of what sort of data it is, and churns out books with it. It doesn’t matter if no one’s interested in the statistical prognostications for the Indian mid-sized bathmat industry, because each book is printed if and only if someone actually orders it; a copy may never actually exist. But considering there are libraries around the world that will buy a copy of each and every publication under the sun, Parker is probably earning a lot of money. Thank you for your concern; there are no copyright violations. Please feel free to copy my puzzles for your teaching4. p.s. translations of words, themselves, cannot hold copyright, only the format in which they are presented (translations of single words are public knowledge; translations of creative works are not). I will later be doing anagrams, poems, rhyming sections, etc.. java-based web games (free to use), etc. It is not possible to copyright common knowledge such as words and meanings. Unfortunately for Parker, some of the quoted forms, like muRumuRu on page 11 are creative works since they are reconstitutions which I have posited on the basis of 19th century published and unpublished amateur recordings (as explained in the preface of my dictionaries — note that the orthographic R is not a Gamilaraay sound but a cover term for where I could not determine whether the source represented a flap rr or a continuant r). Now that is copying of creative work without attribution, in my view. It may turn out to be a little more difficult to demonstrate some ‘creative work’ with the Wagiman dictionary, and we may just have to accept that legally, this sort of blatant plagiarism will be allowed to continue. Let my warning be this: If you find a book written by Philip M. Parker that looks interesting, avoid it; you can probably find the content online for free. I love the review of the aforementioned “tome!”. If not also automatically generated, then at someone has a got a sense of humour. Philip M. Parker, the world’s undisputed expert on tufted washable scatter rugs and bathmats on the Indian subcontinent, has contributed immeasurably to the English-language literature on this complex and fascinating subject with this long-overdue book. Known for his ability to take complex ideas on scatter rugs and present them skillfully to a general readership, Dr. Parker’s tome should find a much deserved place in the personal library of anyone interested in washable scatter rugs and bathmats in India, academic scholar and lay enthusiast alike. Even those whose interests trend more toward tufted scatter rugs and bathmats of the non-washable variety will find useful information herein. The first in a planned two-part series, the next of which will cover tufted washable rugs, bathmats, and sets measuring greater than 6-feet by 9-feet, Dr. Parker’s intellect and, at times, wit resonate on page after painstakingly-researched page. My only reservation, and the reason I gave this book 4 out of 5 stars, was that at 325 pages, some of Dr. Parker’s analysis seems hurried, especially in comparison to some of the more scholarly books available in Hindi. But, considering the paucity of English-language literature on the subject, Dr. Parker’s book is nothing less than a triumph. He sure does make it sound interesting. Lucky then, that Amazon.com has put this book on special. You can now read all about washable bath mats and scatter rugs in 5,000 Indian cities for no more than US$458.00 (plus P&H). Very informative review. 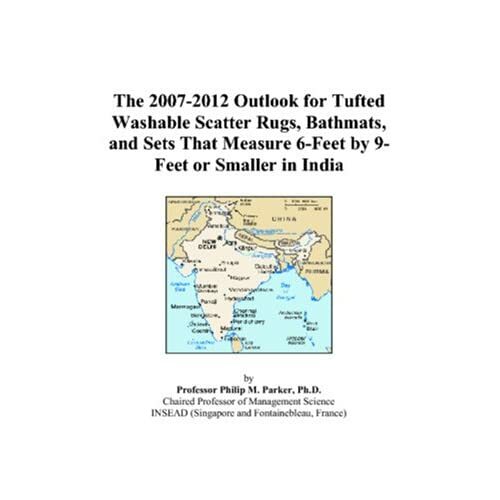 I am looking forward to your review of Philip M. Parker’s next masterpiece, The 2007-2012 Outlook for the nail clippings’ length of the men of sub saharan nomadic tribes. I wonder if the spelling Wageman is another attempt to get around copyright. One might argue that it’s a different language from Wagiman, except it just happens to be 99.9% mutually intelligible. I received an email from Wayne Layman this week pointing me to your blog. If you have sent me an email, I am sorry for not responding; his emails were sent to an account that is monitored for volunteers, and I did not see them until now. He felt that you may have sent me an email (or two). I do not have records of these under the name jangari (I have checked all folders, including spam folders, but there may be errors in this way of looking). If you sent me an email, can I ask you a favor to resend to phil.parker@insead.edu. I will be more than happy to address your concerns. I have not recieved many emails from people on this topic. If I have not heard from you (or you are using a pen name that I do not recognize), please send me an email at phil.parker at insead.edu letting me know. As my post, in the link above explains, I am more than happy to give any citations, or make corrections or delist titles that serve no purpose, but I need to hear from people in order to do so. Matjjin is a Wagiman nominal root meaning language, word or story and nehen is the privative case suffix, 'without'. Googleganger: Word of the Year? If you're still reading all this then perhaps you have a fetish for small print.